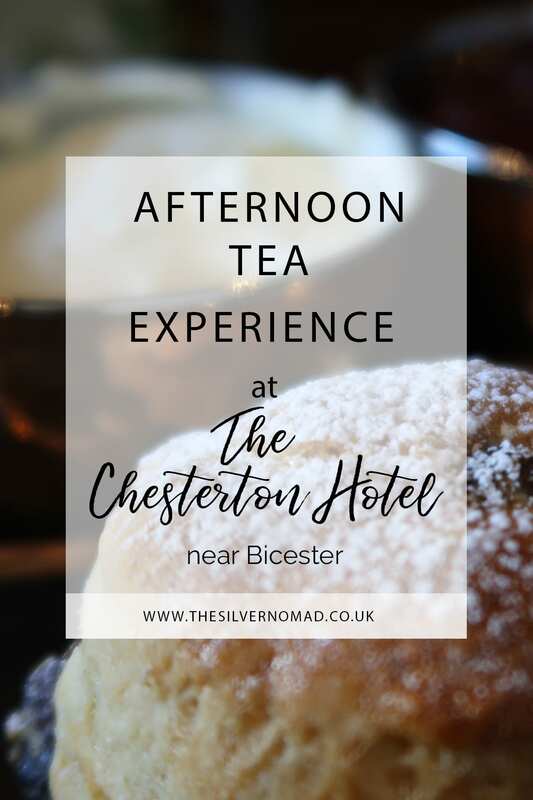 This post about the Afternoon Tea Experience was created in collaboration with The Chesterton Hotel, Bicester. 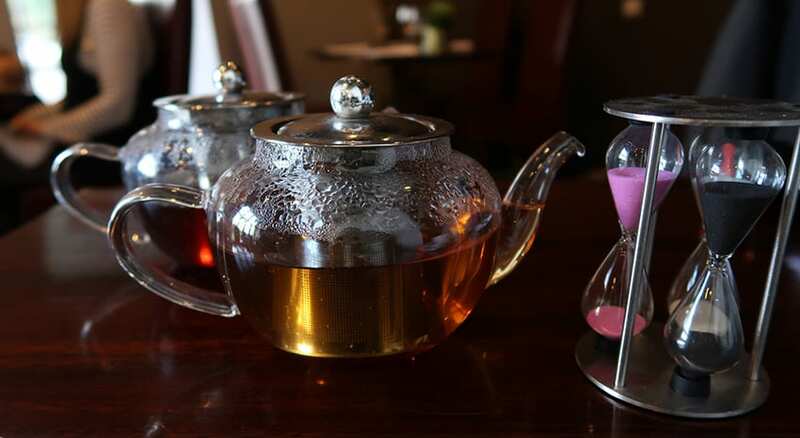 Two elegant glass teapots are gently placed before us, one with amber liquid and the other a deeper almost ruby red. A silver timer with 3, 4 and 5 minutes engraved on the top is put next to them. Our teas would take 4 minutes to be perfectly brewed. 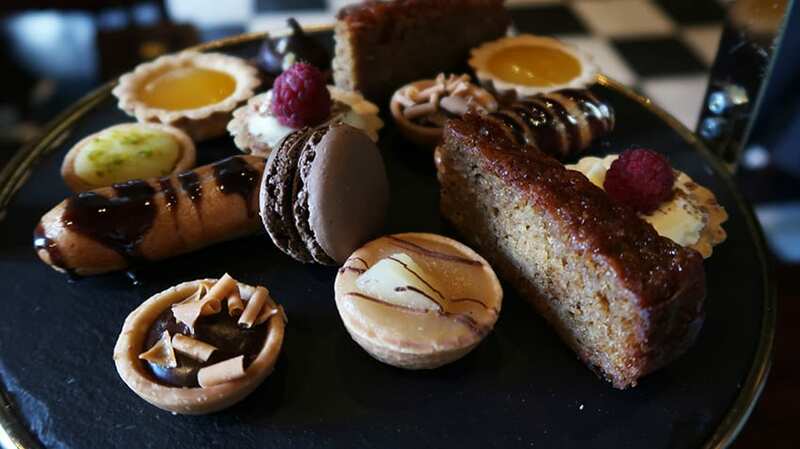 The Afternoon Tea Experience is a delight for all the senses. We are sitting in the understated and stylish Dining Room in The Chesterton Hotel near Bicester with the soothing tones of Frank Sinatra playing in the background, just taking in our surroundings. 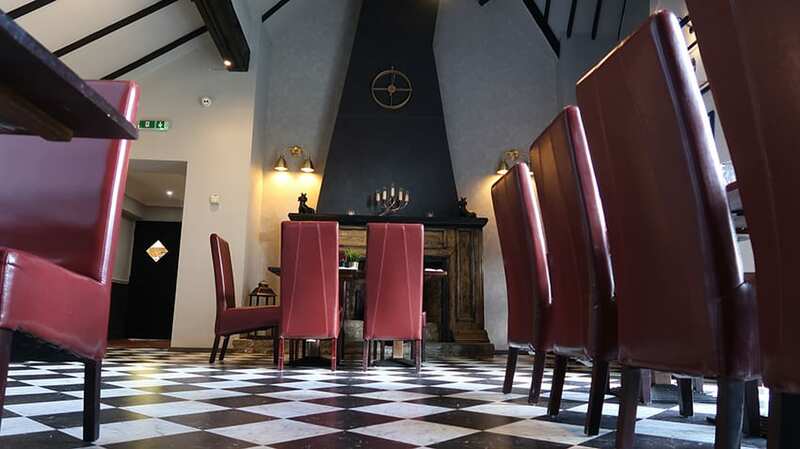 The checkerboard black and white flooring and the impressive chimney breast leading up to the beamed ceiling. I used to love going out to afternoon tea with my Grandma in Edinburgh. I felt so grown-up as I chose my favourite fancy cake and sipped my cup of tea, which was probably just builders, but it felt like the most exotic tea ever to my young self. As I grew up, life got in the way and I stopped having afternoon tea. I now maybe grab a quick coffee from a high street coffee shop (tea is never good in a paper cup!) or I make a cup of tea wherever I am. So it was a delight to indulge ourselves at the Chesterton Hotel. As you can imagine, I was like a kid in a candy shop when I was presented with 12 different teas to choose from, I even clapped my hands in delight! Arriving in glass jars with cork stoppers we opened them to sniff the different aromas. What would we choose? Maybe the smoky Lapsang Souchong, sweet and subtle Jasmine or the divine scent of Double Happiness, a heavenly mix of marigold and globe amaranth blossoms which unfurl their petals to reveal a flowery taste? 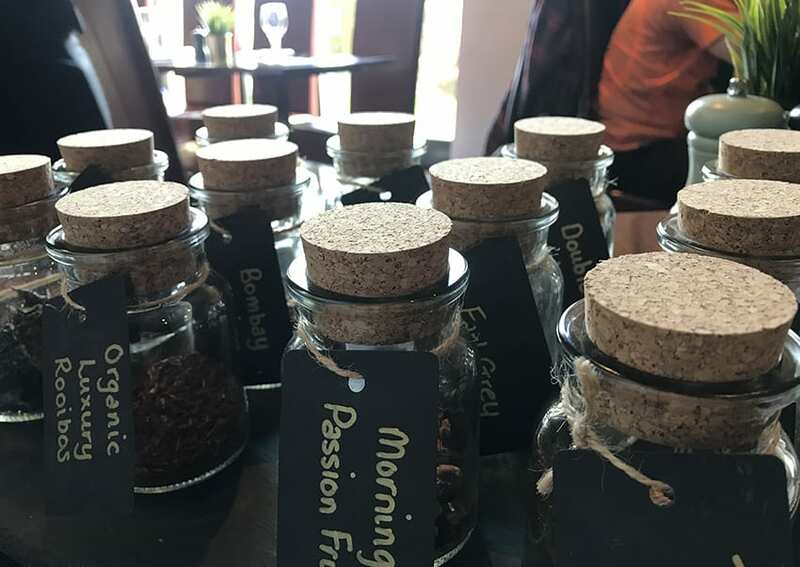 After much deliberation, we finally decided to go for something a bit more exotic: Bombay Chai, a spicy mix of Indian cardamom, cloves, cinnamon, ginger and bay and the intriguing Coffee Truffle with a hit of coffee and chocolate combined in a tea. As we waited for our 4 minutes of brewing, our sandwiches and cakes arrived on a slate and gold two-tiered cake-stand. The lower tier was covered with crust-less well-filled sandwiches, beef with brie and cranberry; smoked salmon with crême fraiche; cheddar, tomato and cucumber with French dressing and finally creamy egg mayonnaise with cress on a soft sub. 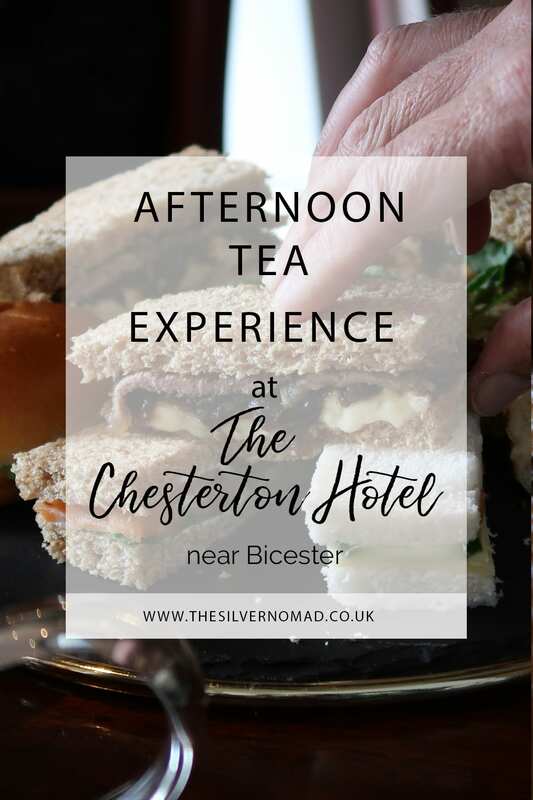 I have to admit that I am not a great butter fan, especially on sandwiches, but the Chesterton Hotel sandwiches had enough to bind the fillings without overpowering their flavour. And, oh, the top layer of homemade cakes…. perfect little choux eclairs, bite-sized tartlets with a variety of fillings lemon, chocolate, cream and raspberries. There was moist banana cake and on a separate plate two deliciously deep fruit scones with clotted cream and strawberry jam in hammered copper dishes. Time to Eat and Drink! It was tempting to launch straight in and sample a bit of everything, but we were good and waited for our tea to brew. First we tried the Bombay Chai. The heady notes of the cardamom, cinnamon and other spices filled the air as Alan poured the tea into our cups. I chose to drink my tea without sugar or milk, and wow, the flavour was amazing, you could taste the spices with a mellow tea behind it. 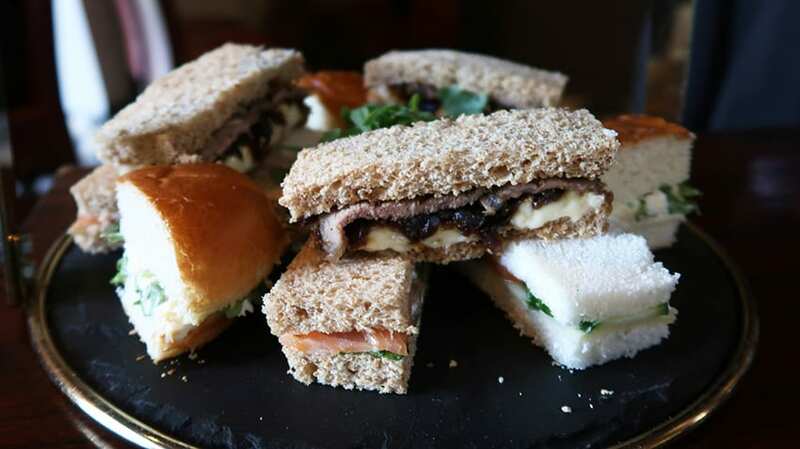 We ate the savoury layer with the Bombay Chai, which complemented the sandwiches perfectly. There were 12 sandwiches between us, three of each, which was more than enough for the two of us. Each of our pots of tea were good for a generous 2 cups of tea each. Before we went on to the sweet treats, we had a little hiatus to pour the Coffee Truffle tea. Now this is an amazing tea with hints of coffee and a delicious chocolatey taste, it didn’t need sugar or milk, it was perfect on its own. And now to delve into the sweet treats on the top tier, they are so much better than the fondant fancies of my childhood; crisp pastry cases with tangy citrus centres, or cream and raspberries. Maybe chocolate is your thing, there were fresh mini chocolate eclairs, chocolate macaroons and a chocolate tart which was gone in two bites! If all that was not enough, we still had two fruit scones to devour. With an icing sugar sprinkling the scones were deep and perfectly formed, the strawberry jam was bright and sweet and a perfect foil for the clotted cream. Okay, let me digress a bit. There is a debate about how to pronounce the word “scone”. Should it rhyme with “bone” or with “gone”? I must admit I am a “gone” girl, like 51% of the country as per the YouGov poll in 2016 outlined in this article in the Telegraph. The other issue that people cannot seem to agree on is which comes first, jam or cream. 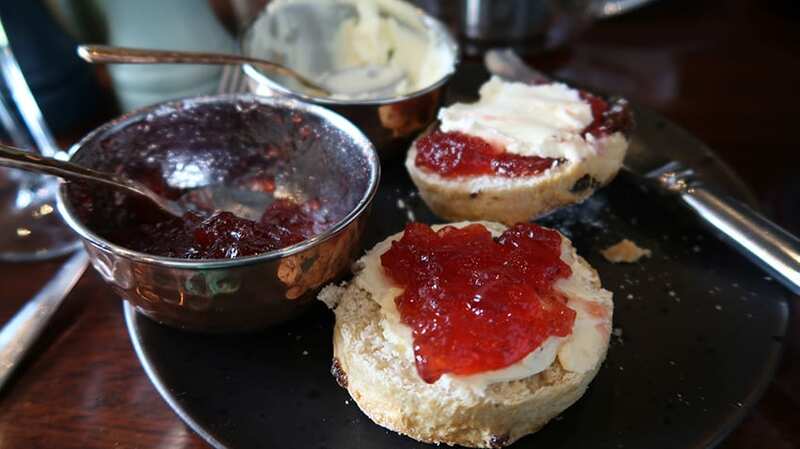 At great personal sacrifice, I put it to the test: First I tried jam first with a dollop of cream on top – the favourite of 61% of the UK and the way they do it in Cornwall. It was a bit difficult to get the cream to spread on the jam and the sweetness of the homemade strawberry jam comes through with just a subtle softness of the cream. Then I tried the clotted cream first with the jam on top, which is how I do it. This was interesting as it did not seem as sweet, even though there was the same amount of jam, it was a perfect balance of the two and I could taste the scone more. I much preferred it. So after my highly scientific experiment, the conclusion is the best way for me to eat scones is cream first then the jam. What do you think? 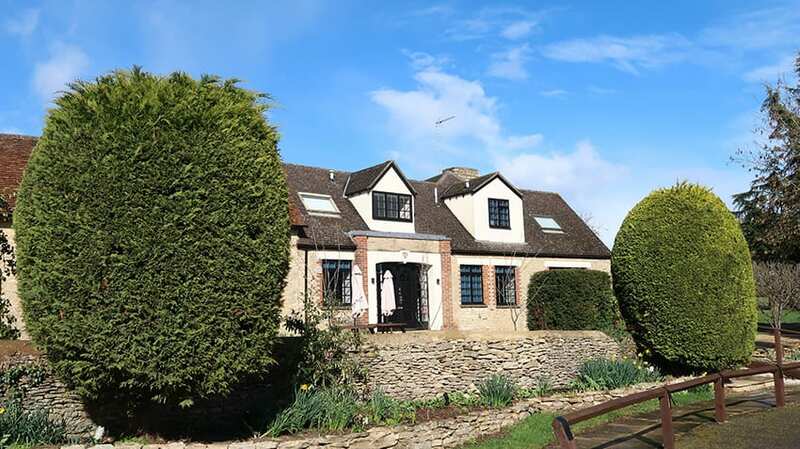 The Chesterton Hotel is an 18th Century former Manor house in the Cotswolds built in typical cream stone. In May 2017 it was taken over by the Gill family. The interior has been redesigned by owner, Kaven Gill. His impeccable taste and attention to detail, has given the hotel a sleek and contemporary look which would not be out of place in London, with greys, aubergines, gold and slate and a signature dark floral wall. Also look out for Chester the dachshund who appears in every room! 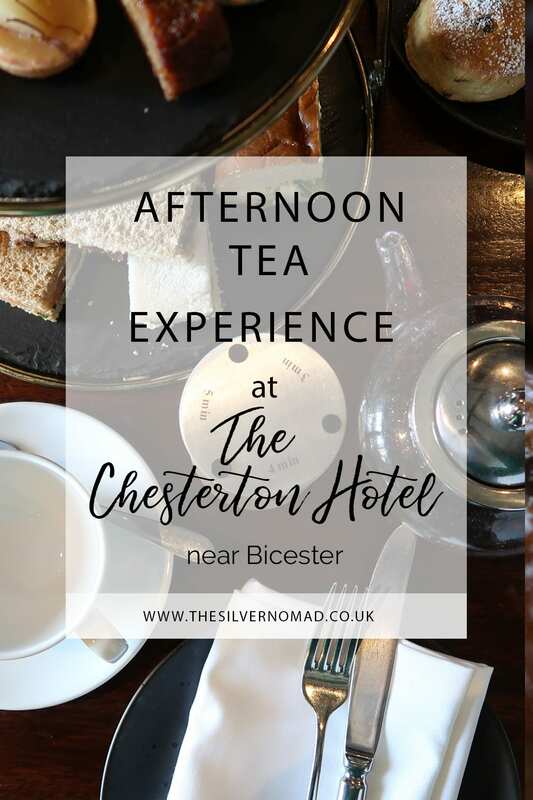 The Chesterton Hotel Afternoon Tea Experience costs £19.95 per person and is perfect for combining with a trip to Bicester Village. In fact, the Hotel also offers a Shop and Stay package combining a night in one of the Deluxe Rooms (subject to availability) with VIP treatment at Bicester Village. Danielle, it was so good, I highly recommend it!